Regiment East Rand  is a reserve infantry battalion of the South African Army. The unit was intended initially to be predominantly an Afrikaans speaking citizen force. As a reserve force unit, it has a status roughly equivalent to that of a British Army Reserve or United States Army National Guard unit. 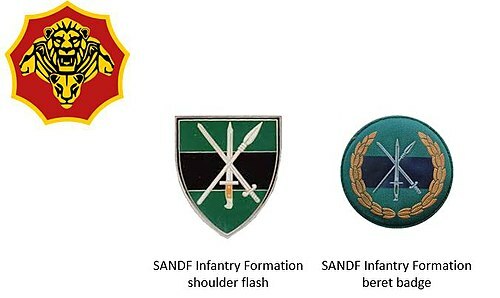 With the re-organisation of the military, the four units were disbanded and Regiment Oos-Rand was formed from the integration of Regiment Kemp and Regiment Andries Pretorius. The April 1960 Government Gazette declared that Regiment Oos-Rand was activated on 1 January 1960 as a Citizen Force Unit. Just one week after it was activated, the regiment was mobilised for Operation Duiker and within 24 hours, 240 members were available. The regiments first Honorary Colonel was Senator C.C, Schabort on 9 August 1960. From 1976 to 1979, Regiment Oos-Rand called up members for the border war. By September the unit received it regimental emblem. During 1962 the regiment was re-organised as a motorised infantry battalion and on 14 September 1963 it received its Colours. The regiment received the Freedom of Benoni in 1967. The regiment received its ceremonial sword on the 18 October 1969. From 1983 onward, Regiment Oos-Rand was involved in internal stability and township control. In 1990 the regiment was converted to a mechanised infantry battalion. Regiment Oos-Rand was assigned to the command of 73 Brigade in this era. Today Regiment Oos-Rand, is a typical reserve light infantry battalion. Regiment Oos-Rand is also involved with Operation Corona, a continuous anti poaching operation in the Kruger National Park. ^ Engelbrecht, Leon. "Fact file: Regiment Oos Rand - defenceWeb". www.defenceweb.co.za. ^ Helfrich, Kim. "December a busy month for Operation Corona border forces - defenceWeb". www.defenceweb.co.za. This page was last edited on 22 November 2018, at 02:21 (UTC).